Tonight it was time to check another film off my list of 10 Classics to see in 2013! I started out the year keeping up a good pace viewing the films on my list, watching one film per month, but then I went off track during film festival season last spring -- so now I'll be trying to watch a couple per month for the rest of the year in order to complete viewing my list! When I made up this year's list of films I wanted to be sure to finally see, I decided to include a Western I'd never seen among the titles. 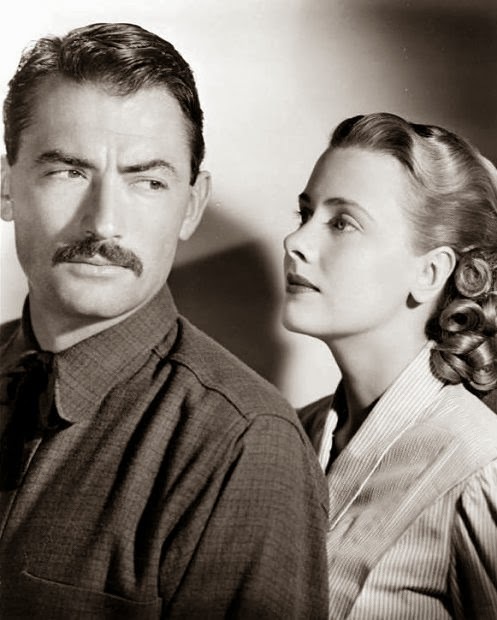 As a Westerns fan, I've caught a great many classic and not-so-classic films in that genre over the years, but it wasn't until I put SHANE (1953) on my list a couple of years ago that I finally saw it. I enjoyed it tremendously, which encouraged me to search for other significant Western titles I might not have seen yet. 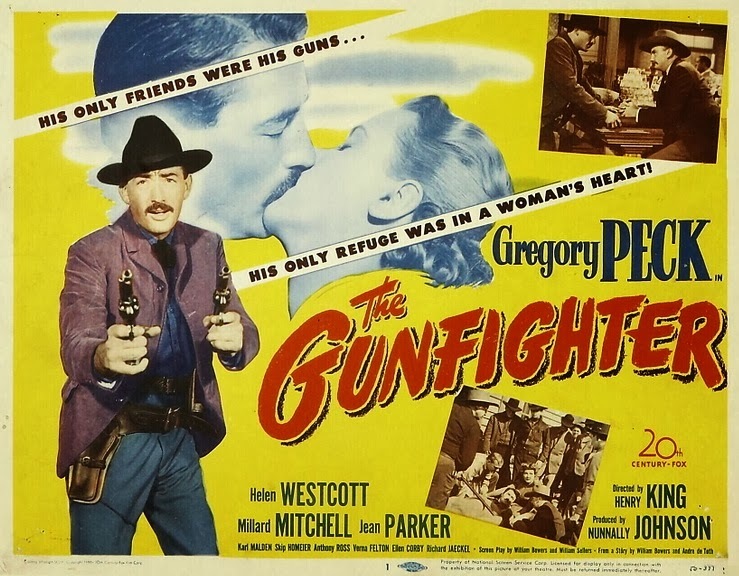 That led me to THE GUNFIGHTER (1950), which currently has a 7.7 rating on IMDb, and I'm glad I chose it. 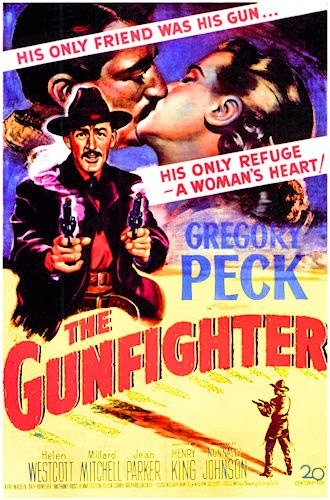 THE GUNFIGHTER was an excellent film, although I admit that the film's overarching sense of doom made it a bit painful for me to watch towards the end. Nonetheless, I recommend it highly. 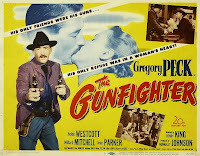 THE GUNFIGHTER, directed by Henry King, tells the story of a day in the life of the title character, whose name is Jimmy Ringo (Gregory Peck). Jimmy, the fastest gun in the West, is weary of being challenged to draw by young punks. On his way to what Jimmy hopes is a new, anonymous life in California or the Northwest, Jimmy stops in the small, muddy town of Cayenne to see his long-estranged wife Peggy (Helen Westcott) and their young son (B.G. Norman), who was an infant when his father last saw him. Hot on Jimmy's trail, looking for vengeance, are the three brothers (Alan Hale Jr., David Clarke, and John Picard) of the last man (Richard Jaeckel) Jimmy had to kill in self-defense. Meanwhile, a nasty young hothead (Skip Homeier) in town wants to make a name for himself by taking on the famous Jimmy Ringo. Homeier honestly was the one clunker in the film for me; I know his character was supposed to be an irrational jerk, but his performance was so over the top loud that I had a little trouble believing him. It was the only performance which took me "out of the story," noticing the actor instead of the character. In some ways this film seemed like a forerunner of HIGH NOON (1952), but instead of a marshal watching the clock, it's a gunfighter. In both cases, the protagonist anticipates men who are gunning for him to show up by a certain time of day, and although the issues are different, there are also significant questions about what actions his proper, ladylike wife will take. Although, as I mentioned, it's hard to shake a feeling that things won't end well, I did like the film's final scene very much. THE GUNFIGHTER's story unfolds in a brisk 85 minutes. 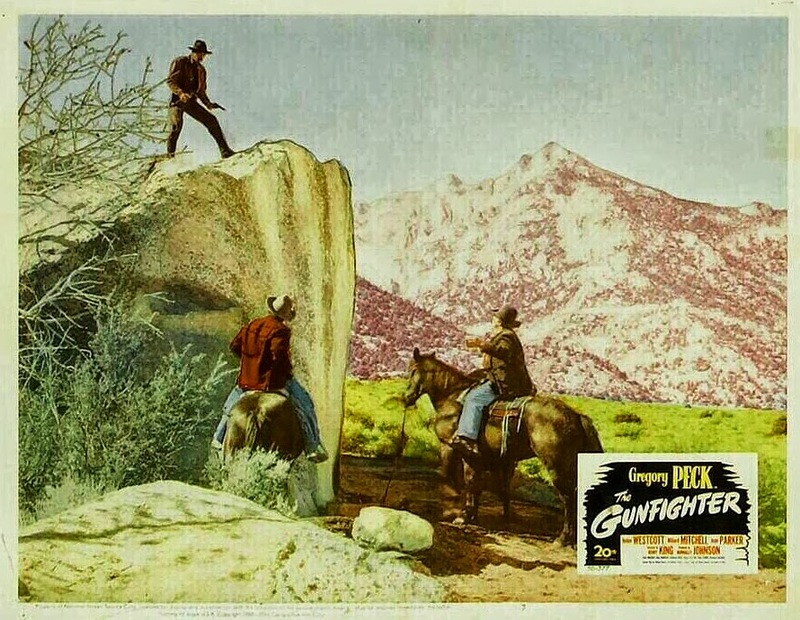 The tightly paced script was by William Bowers, who did outstanding work on everything from THE GAL WHO TOOK THE WEST (1949) to CRY DANGER (1951) to SUPPORT YOUR LOCAL SHERIFF! (1969). Bowers' screenplay was based on a story by Bowers and director Andre De Toth, for which they shared an Oscar nomination. According to IMDb, the story also had uncredited contributions from Roger Corman and producer Nunnally Johnson. THE GUNFIGHTER also has an excellent cast which makes the most of Bowers' sharp dialogue. This surely must rank as one of Gregory Peck's finest performances, as the world-weary, lovelorn gunfighter who can't drink a cup of coffee without first making sure his back's against a wall. He looked authentically rugged and worn down in the title role. This is the best-known performance by Helen Westcott (HOMICIDE, GUN BELT), an interesting, restrained young actress who successfully conveys a long-ago broken heart and longing for Jimmy, along with the steel to make certain her decisions are in their young son's best interest. I was intrigued that despite their strong love for one another, Jimmy and Peggy never kiss (movie posters to the contrary! ); I think perhaps Jimmy felt he had to earn it first, and in Peggy's case, I think perhaps she feared doing so would be an emotional dam break. The supporting cast is topped by Millard Mitchell, never better as Jimmy's fearsomely tough old compadre who is now a marshal. Mitchell's final confrontation with Homeier is unforgettable. There's also a nice role for Jean Parker as the widow of one of Jimmy's old friends. Karl Malden is the obsequious bartender. 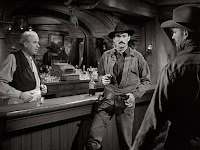 Anthony Ross plays Mitchell's deputy, and James Millican can be spotted trying to keep the peace in the film's first gunfight scene, which incidentally is brilliantly shot and edited. The deep cast also includes Ellen Corby, Verna Felton, Mae Marsh, Cliff Clark, Harry Harvey, and Kenneth Tobey. The movie was shot in black and white by Arthur C. Miller, with locations including Lone Pine and Death Valley. The score was by Alfred Newman. 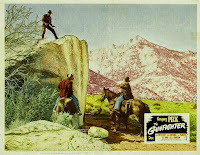 THE GUNFIGHTER is available on DVD in a three-film Fox Western Classics collection, along with RAWHIDE (1951) and GARDEN OF EVIL (1954). Great review Laura of a truly great Western.Strange how Helen Wescott drifted into B Movies after the great promise that she showed in this film. I think we agree on many things Laura but I must say that I thought Skip Homier was wonderful in this film. in many ways this was the template for many Western roles that he played since. I do hope that you get to see CRY VENGEANCE for this gives us a Skip that we have never seen before. I always thought that he was really underrated. He also had a rare leading role in a British B Movie called NO ROAD BACK. Film was above average as these things go and had a very early supporting role for a young hopeful called Sean Connery. A bit off topic here; but as I mentioned NO ROAD BACK (1957) I recalled an amusing story that Sean Connery often refers to. The thing about the internet:seek and ye shall find! This was I believe Seans second feature and he played character called Spike who had a stutter. Cast members Alfie Bass and Paul Carpenter played a very non P.C. trick on the young actor. They suggested that he approach the director Montgomery Tully and ask if he could play the part without a stutter. The young Connery did not realise that Tully had a stutter and the directors reply was - who do you think you are Larry Olivier! I must admit this is a very cleaned up version of the words Tully actually used. Hope you've had a good trip! This is another I have to see! I love Gregory Peck in The Big Country, a great western. Next time, tell us you're going to watch a film in your 10 new classics list. Even if I can't write a post, I want to watch The Iron Horse with you. For Beauty and the Beast, I'll depend on the kindness of some TV station, since I can't find subtitles and I don't understand French. All the others I've already seen. I love THE BIG COUNTRY too, Leticia! I hope you get to see THE GUNFIGHTER soon, I really enjoyed it. I really appreciate your interest in watching from the classics list along with me, and if you post about any of the movies on the list I'd be delighted to add a link to your post to my own. I'll try to at least Tweet when I'm going to watch another one -- it will probably be soon! Most likely BEAUTY AND THE BEAST or THE IRON HORSE will be the next title so I hope it will be possible for you to see them!